What’s your favorite song? Do you have a tune you hum to yourself in the kitchen or blast in the car? 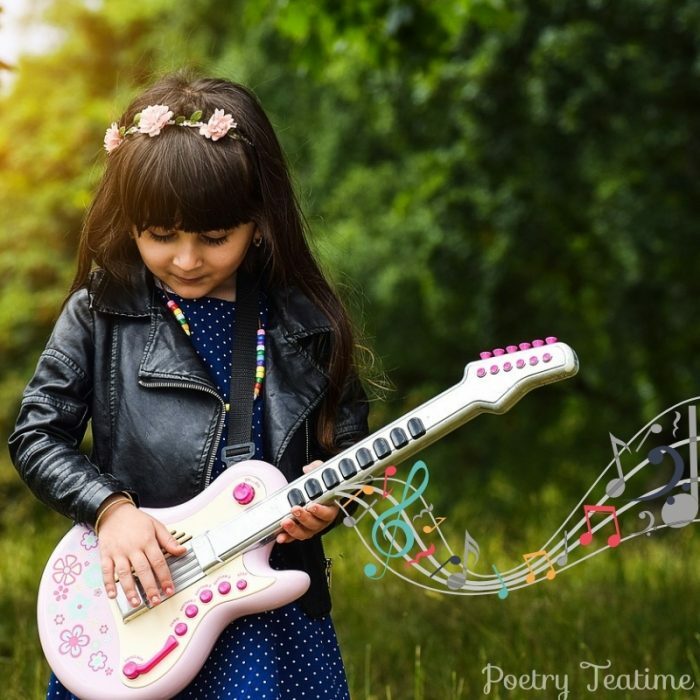 Today, it’s time to channel that musical passion into some fresh poetic inspiration! Go ahead and listen to some music. Let the rhythm flow through you. If you feel like it, tap your toes or even dance! Then, pay attention to the lyrics. If you don’t know the words already, look them up (make sure to supervise your kids!). Read them out loud and listen to the sound of the words. What words do you like? Do any of them sound surprising, strange, or new when you read them instead of hearing them in a song? Write those down! Now, take a line, phrase, or sentence from the song and use it as the starting point of your poem. You can mimic the song’s rhythm and feeling, or you can take those words and go in your own direction with them! If your chosen music doesn’t have any words, then you’ll need to get even more creative. Listen carefully to the different instruments or sounds in the piece. What sort of mental pictures or feelings do they create? Try to echo those feelings or images with your poem. Describe the piece of music using senses other than hearing. For example, what images does that song make you see in your imagination? Does the piece remind you of any colors? What about smells? Pretend that the piece of music tells a story. What characters are there? What are they doing and why? Enjoy listening! Be sure to share your compositions and teatime stories with us here!